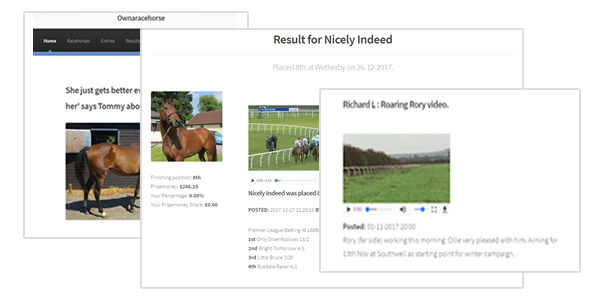 If you are considering buying a share for the first time from us we can understand that you may have some reservations - for example, what happens if your horse is unable to race to to injury or training setback? That's why with each racehorse share bought through Ownaracehorse you get a commitment - the Ownaracehorse Value Guarantee. Our guarantee commits to replace or transfer your ownership into another horse of a similar type and location, if it becomes apparent during the share period that your racehorse will be unable to continue racing and hasn't already been racing a minimum number of times. Where can I read my Ownaracehorse Value Guarantee? For each racehorse we produce a 'Racehorse Profile'. Part of a horse's profile is a statement of what we expect from each individual racehorse. Usually we will provide a transfer if your horse isn't expected to manage a minimum of two or three racecourse runs during the share period. The guarantee changes slightly depending on the age and type of racehorse chosen. When will a transfer be made? Once we receive news from a trainer that a horse may not be able to race for the remaining duration of a share period, shareholders are immediately informed, and a replacement is made as soon as possible, assuming the horse hasn't already raced the minimum number of times. Do I receive all the same benefits with the new racehorse? If you have been provided with a transferred racehorse you will be able to visit the yard, apply for owners badges and receive all the racehorse updates. So, your ownership experience will be exactly the same. Unfortunately we are unable to provide prizemoney payments on any transfers. Have you always done this and will you continue to do so? Since 2004 we have provided transfers for over 25 racehorses - each shareholder has benefited from a new horse which has raced for them. Injury or training setbacks are all part of racing, but we do our very best to ensure our shareholders don't lose out if their racehorse is unable to race at least a few times during the share period. We believe it is an essential part of our commitment to our customers and expect to continue providing this guarantee, even though we are to our knowledge the only syndication company to do so. Replacement shares run for the same period as your original share. The choice of transfer racehorse is made by Ownaracehorse and is non-negotiable. If you would like speak to someone before you purchase a share, then please call our Helpdesk, we're happy to explain exactly how we manage our horses and our shareholders.